When Ton was born, he was the 3,196,990,596th person alive on Earth and the 76,991,413,470th person to have lived since history began. When Sjoukje was born, she was the 4,244,325,821st person alive on Earth and the 78,713,118,072nd person to have lived since history began. When Danique was born, she was the 6,682,611,262nd person alive on Earth and the 82,672,064,059th person to have lived since history began. Want to find out more? Visit the UN Population Fund’s detailed population calculator, 7 billion and me. Notes on the data: Only birth dates after 1910 can be accommodated and only countries with populations of more than 100,000 people are included. Where available, the UN’s medium variant and average figures from 2005-2010 have been used. World and country population clocks are estimates based on the latest UN figures and growth rates. They may not tally precisely with other clocks because of the way this application is configured. Su 30-Oct-2011 15.30: Eredivisie Live was showing Groningen-Feyenoord. 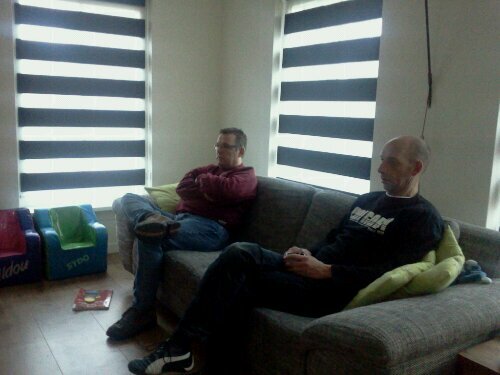 Kor and Ton are watching the game on tv in Wirdum, while the half time score is 3-0. The final score was 6-0! Sa 29-Oct-2011 15.45: After a bike ride via Laren and Blaricum we were having a break at De Tafelberg restaurant patio in Blaricum. At a whopping 14 degree afternoon with hardly any breeze. 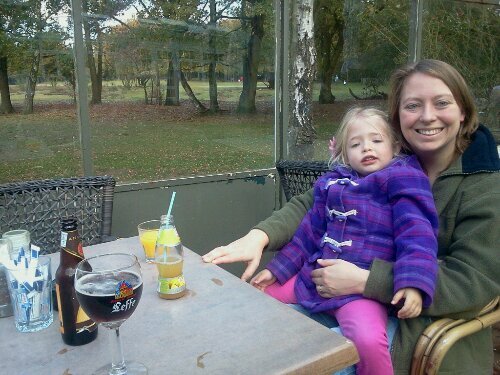 In Laren Sjoukje spotted one of the “Gooische Meiden” at restaurant Mauve’s terrace. 25-Oct-2011: Ton attended the first day of a 3 day course called “The Challenging Minds”. Sa 22-Oct-2011 10.00: Danique’s first time on her bicycle without the helping wheels on the side. At first it was difficult to keep the balance, but after a few minutes she was riding her bike on her own. She even made her first turns. Unfortunately there are no pictures of this major event in Danique’s life. Sa 22-Oct-2011 16.00-18.00: Danique’s first bowling experience. 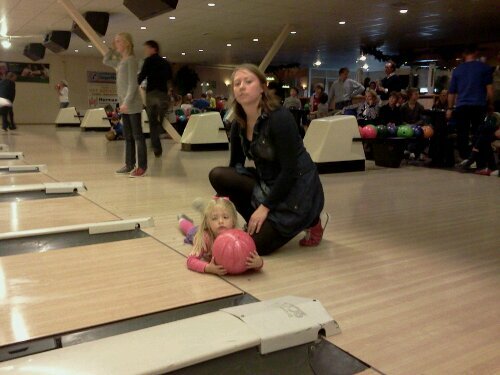 We went to bowling venue De Graaf Wichman in Huizen with Peter, Froukje and Dettie for Sjoukje and Danique’s birthday party. It was a very interesting evening and Ruud rewarded Ton with a start watch certificate. Unfortunately around midnight clouds crossed the sky and we had to call it a night. 09-Apr-2011 13.00: Joeck landed with Delta Airlines flight DL1224 from Seattle to Amsterdam. Ton awaited him at Schiphol Airport. 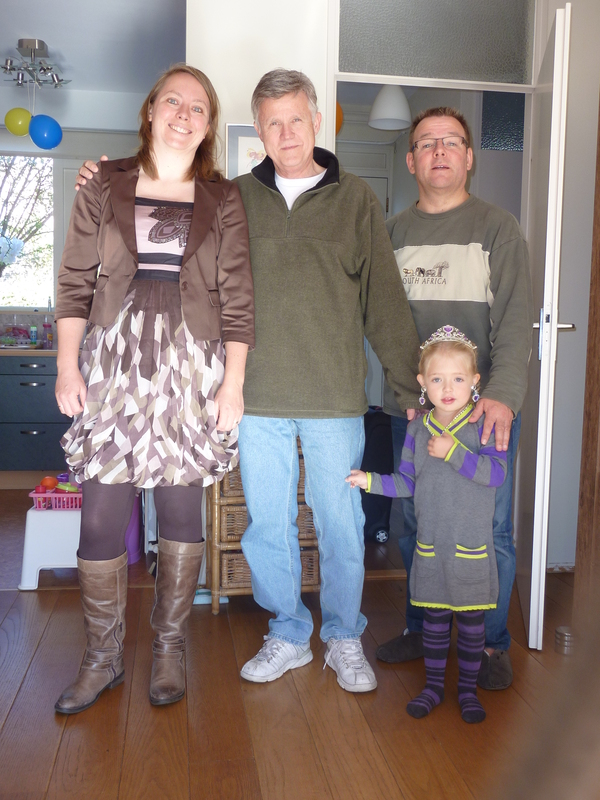 Joeck will stay in Europe to visit friends and family. 07-Oct-2011: Today is Danique’s first test day of school in group 1 with teacher Antje. She is allowed to visit her class 3 days to get used to school and she has been waiting for this day for almost a year. Now that big day has arrived. Sjoukje and Ton walked her to school. Ton stayed a bit and then Danique was on her own. She got used very quickly. Britt already took care of her. Class was from 08.30-11.45. 04-Oct-2011: Ton had beers and dinner with colleague Peter and former colleague Eco at ‘t Ij Brew Pub in Amsterdam.